We earlier reported that the Classic Win32 app of Paint will be soon killed by Microsoft and will be replaced with the all-new Paint 3D UWP or Universal Windows Platform app. Actually, this really happened with the release of Windows 10 Fall Creators Update but partially. The classic paint app was hidden by Microsoft by default and the new Paint 3D App was favored with every suggestion including in Open With and Cortana Search. The Paint app will move to Microsoft Store! 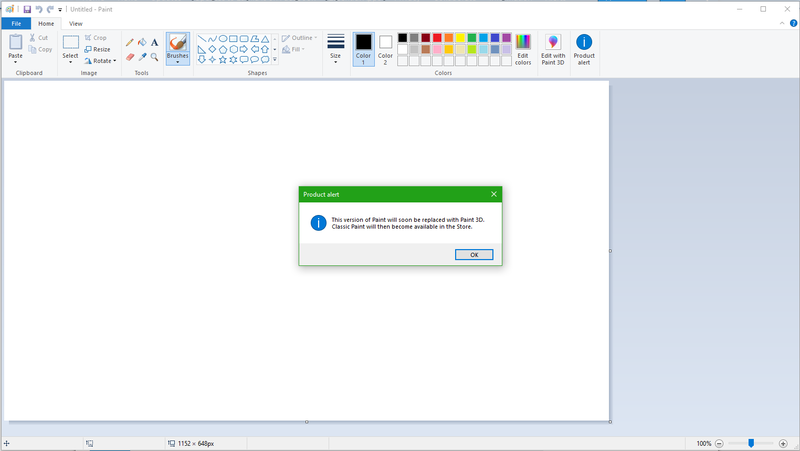 As you can see in the screenshot above, the new prompt by Microsoft in the classic paint app says that the app will not be removed totally from the Windows 10 platform but will be available in the Microsoft Store for the interested users to download. We observed this prompt in Windows 10 Insider Preview Build 17063. My opinion says that this is a good step by Microsoft as I still like using the old Paint rather than the new UWP appbeause that is something I am more familiar with and it gets me my work done faster and in an easier way. What do you think about this decision? Let us know in the comments below!